Where was the first European born? When did first human set foot in Europe? And can Bulgaria be the bridge on which the first representative of the genus Homo is passed from Africa to Europe? Some sensational discoveries in the cave Kozarnika near Belogradchik overturned the previous theories of French and BG archaeologists. Before it was believed that our predecessors crossed from Africa through Gibraltar. This was supported by findings in Spain from 800 000 years ago and in Turkey from 400 000 years ago. However, in 1996, French archeologists came across traces of human life in Kozarnika dated to 1.6 to 1.4 million years ago. 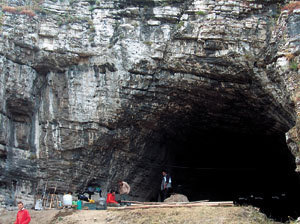 The Kozarnika cave was discovered by archaeologist Raphael Popov in 1933 . According to him, the cave housed people back in the Stone Age. Since 1996, a Bulgarian and a French team led by Prof. Nikolay Sirakov from the Institute of Archaeology and Jean-Luc Guadelli from the Institute of Geology and Prehistory of the Quaternary in Bordeaux return to the cave every summer to study the paleontology and geology of the cave. The discovery which led to an extraordinary interest in the cave is a tooth which once belonged to a representative of the genus Homo - most likely a Homo erectus. The layers of the cave reveal a late-paleolite culture from 37-34 millennia ago. The findings of human activity from before so many years ago in the Kozarnika cave changed the theory of man's path from Africa to Europe by eliminating Gibraltar and rather supporting the Bosphorus as a possible pathway. This is the logical route for the prehistoric man who ended up in the cave, French scientist Jean-Luc Guadelli said. The excavations continue. Archaeologists have found bones and skeletons of animals - lions, panthers, horses, cave hyenas - that have long disappeared. They also detected tools and weapons from flint and bone. The archaeologists are able to scan a 50 cm layer per season, but they are interested in more than 7 meters, so the excavations will continue.